8. LIHTC - 2016 Procedu­res - Draft /con­tent/Mul­tifa­mily Docu­ment Lib­rary/2016 LIHTC Procedu­res ..
10. LIHTC- 2016 Qua­lified Al­loca­tion Plan - Draft /con­tent/Mul­tifa­mily Docu­ment Lib­rary/!2016 QAP Red­li­ne .. In total 4 links were found which refer to Chfa.org. Individual words like Agency, Finance, Housing and Connecticut are frequently used in text links from other websites. The most important link sources for this website are Neighborworks.org and Sustainablenyct.org. The sites /Homeownership/for Homeowners at Risk of Foreclosure/EmergencyHomeowners LoanProgram.aspx and /Homeownership/for Homebuyers/default.aspx are frequently referenced by external sources. The table shows the most important links to Chfa.org. The table is sorted in descending order by importance. The table shows websites of Chfa.org, which are often linked by other websites and therefore they are classified as important content. four profiles were found for Chfa.org in social networks. Among other social networks the website is represented in Facebook, Twitter, Pinterest and LinkedIn. 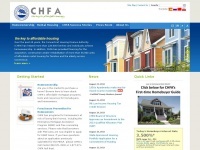 The web server used by Chfa.org is located in USA and run by Connecticut Housing Finance Authority. The website Chfa.org has a own web server. The web server only runs this website. The content management system DotNetNuke is used. The visitor analysis software Google Analytics is used to analyze the visitors of the websites. The website does not specify details about the inclusion of its content in search engines. For this reason the content will be included by search engines. The homepage of the website is "/default.aspx".